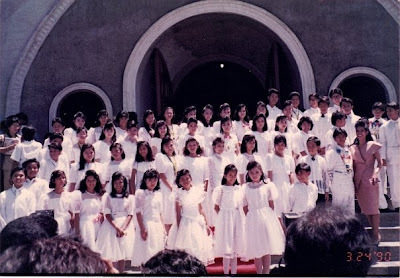 Pinay WAHM: Blast from the Past...via Facebook! Blast from the Past...via Facebook! My former students in the Philippines found me in Facebook. They were my very first students...my 'baptism of fire' so to speak. I was a wide-eyed [literally] 20-something first time teacher when I took the job. I wasn't a fresh graduate though. I graduated the year before. I took a year off after graduating from college to take the board exam and the civil service exam. Fortunately, I passed both so I didn't have a hard time finding a job when I looked for one. Anyway, these students are now in their 30s. I am only 10 years older than them. They were in Gr. 6 when I was assigned to be their class adviser so I was like a kid playing teacher. I was so rigid when I was their teachers because I didn't know any better. I honestly think they hated me because I somehow hated myself for being that way. But I learned to loosen up after a while. Somehow they started to become my friends outside the classroom that I was even invited into some of their 'lakwatsas'. Btw, if you look really closely, a Filipina actress - G. Tongi - was in the picture. She was in my advisory class. She's the 5th student from me to the left. Its me Giselle! Of course I remember you as my teacher!!! Where are you now??? I am now in LA with two children and still going to school. Hope you are well and thanks for the special mention! haha, kakaaliw ang mga "looks." I do have tons of pics too with that spray net 'do. grabe ang tigas, tigas. a little early today. although I went to bed late, I woke up earlier than midday kasi my cousin lawyer is hounding me. tawag ng tawag sa phone. I'll be off to the gym downstairs in a few. hope your Friday is not rainy para maka laro si E outside. how cute. and look at the hairdos,lol!i had those bangs too back in elementary and high school.i can't believe they look so funny now hehe. btw,i salute educators like you. Wow ha! ang nice naman ng picture nato. oo nga spray net uso talaga yan in the 80`s I remember it clearly hehehe. nag comment din si G. Tongi dito kaso lang wla naman siyang link. Wow two kids na pala cya, last time I heard nangangak cya sa first baby nya, ngayon two na pala! Have a great weekend with your family! Giselle! Great fan mo ako, magbalik ka comment ka uli pls. bigyan mo ng link ang name mo or may FB ka ba FS din? curious ako makita ang byoti mo ngayon. Idol na idol kita noon ka love team mo pa noon si Diet!! magbalik ka ulit dito sa blog pls!! Hinde talaga kaya ng powers ng wind e-blow ang hair mo. I think frozen na yata yan. Hehehe.. jowk!